The Walking Dead Zombie Inside Mug | Nerd Much? There is certainly no shortage of great nerdy mugs floating around the web, and now we’re starting to see mugs with gimmicks. For example, the Star Wars Darth Vader Heat Change Mug that changes its design based on the temperature of the contents within. 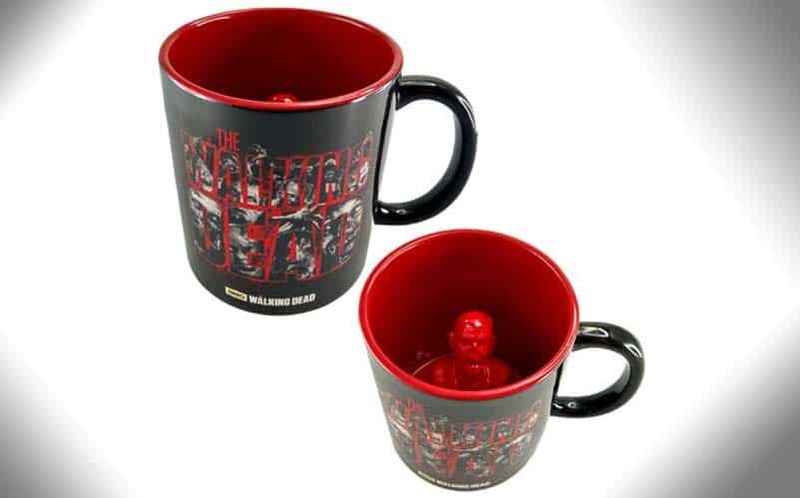 Now, there’s a great new gimmicky mug out there for The Walking Dead fans: The Walking Dead Zombie Inside Mug. The 20 oz. mug looks tame enough on the outside, with a simple black and red design sporting the show’s logo on its side. But when you take a look inside of the mug, you’ll find a glossy blood red zombie protruding up from the middle. So, as you sip more coffee and become less of a zombie yourself ever morning, you’ll see more of the walker. The zombie and mug are both made from ceramic. The Zombie Inside mug will ship in August, and it’s available for pre-order now via Entertainment Earth — meaning you’ll have it before Season 7 starts. The nerdy mug will make a perfect addition to your kitchen collection. Buy the Walking Dead Zombie Inside Mug here.